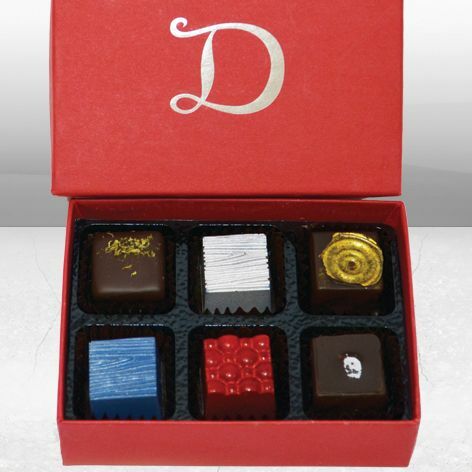 Demarquette X (TEN) Chocolate Collection - a luxury chocolate variety exclusive to Demarquette Fine Chocolates. Celebrating our first full 10 years and looking into the future, we bring a collection that is made of past classics and future contemporary creations. All of Marc’s savoir-faire and skills are put to the test! 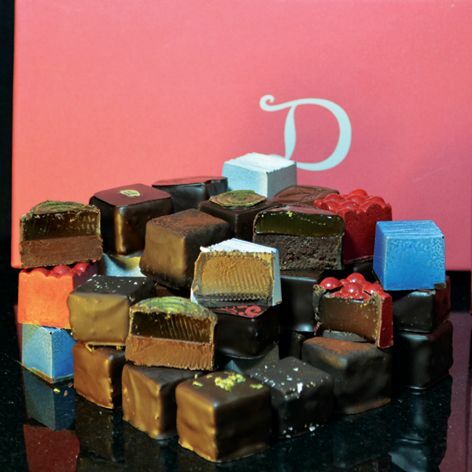 Demarquette Fine Chocolates opened its doors in September 2006. Since, we have worked with all the independent luxury Department stores in the UK sharing our exceptional quality to delight their customers. Rated by the FT as one of the top 10 Chocolatiers in the World it is no surprise that our new collection has demanded a pure perfect outcome. Basils & Limes: Gold, Jelly made with a blend of 3 Basils on a ganache bed infused with 2 Limes. Fraise: Wild Strawberry caramel in a special 65% Milk chocolate cube. Blue mountain: Dark Chocolate cube made with pure Caribbean cacao filled with ganache infused with estate Coffee. Tres Venerable: A jelly made with the exquisite Delamain Tres Venerable cognac on a ganache bed infused with wild honey and toasted anis and fennel. Cobnut: a cube made with our special 65% milk chocolate filled with a lightly salted cobnut praline. Lord Grey: Gold Medal, our very own version of Earl Grey using fresh Bergamot and Tea. Royal Merina: Triple Gold Award pure Madagascan chocolate and Vanilla ganache. Imperial China: Triple Gold Award Fine Green Tea & Jasmine infused ganache made with Vietnamese chocolate. Lost kingdom: Silver Medal pure Venezuelan double ganache. Catongo: Silver Medal single wild bean variety from the Brazilian Amazon. Grandiflorum: Silver Medal pure Theobroma Grandiflorum ganache enrobed on pure Brazilian chocolate. African Queen: Triple Gold Award pure African cacao and honey on a praline crunch base. We hope you enjoy our exquisite new X collection. For deferred deliveries please choose Special Delivery postage option.